A builder chased after and hit a crook after a £100 generator and tools were stolen from a yard at the side of his house, a court heard. Drug addicted thief Kenneth Archer (56) was punched in the face by the victim, fell to the floor and was detained. The victim, alerted by a security light at his property near Brunshaw Road in Burnley, had been scared because Archer and an accomplice were holding a chisel and metal bar which they had taken. 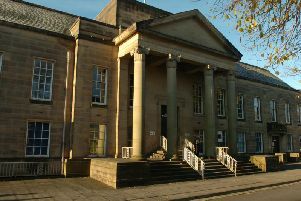 The town's magistrates were told how Archer, who started taking drugs in 1983, had relapsed. He been getting help from Inspire, the treatment service, and had now been offered a job there. The defendant had been locked up for four years for burglary in 2014. Mr David Norman, defending, told the hearing Archer came across as very placid. He continued: "I was very surprised to see his record as I don't think his record fits the person he is now ." The solicitor said the defendant had kept kept out of trouble after being released from prison in 2016. Mr Norman said Archer was introduced to drugs in 1983 and his offending had all been drug-related. The solicitor continued: "He is now 56 years of age and that's old for a drug addict." Mr Norman said the defendant was working with Inspire and had been volunteering, helping others. The solicitor went on: "He tells me he has been offered full-time employment with Inspire and is due to start there at the end of April. I think that's quite an achievement for a drug addict." Mr Norman said Archer, who attended Narcotics Anonymous and Alcoholics Anonymous, had been walking past what he described as a tip and saw the items he went on to steal there. The solicitor added: "Had he not been under the influence of drugs at the time, he might have formed a more clear view that they might have belonged to somebody." Archer, of Brownhill Avenue, Burnley, admitted theft on March 19th. He was given a 12-month conditional discharge and must pay £85 costs and a £20 victim surcharge.